GARSTANG, a small town, a township, a parish, a sub-district, and a district in Lancashire. The town stands on the river Wyre, the Preston and Lancaster canal, and the Preston and Lancaster railway, 11 miles South of Lancaster. It was occupied by the Pretender, for a short time, in 1715. It is irregularly built; possesses one main street; and presents an unattractive appearance. It has a bridge over the Wyre, a town-hall, a corn-exchange, a church, three dissenting chapels, a head post office, and a railway station; is a seat of sessions and a polling-place; was incorporated in 1314, with renewal of charter in 1680; and is governed by a bailiff and seven capital burgesses. Fairs are held on Holy Thursday, 10 July, and 22 Nov.; a good corn trade is carried on; and many of the inhabitants of the town and neighbourhood are employed in corn mills, worsted mills, and cotton factories. The township comprises 500 acres. Real property, £2,684. Pop. in 1851, 839; in 1861, 714. Houses, 158. The decrease of pop. was caused by the migration of operatives and the pulling down of old cottages. The parish contains also the townships of Claughton, Catterall, Kirkland, Nateby, Winmarleigh, Cabus, Barnacre-with-Bonds, Nether Wyresdale, Forton, Holleth, Cleveley, Bilsborrow, and Pilling. Acres, 31,403. Real property, £44,864; of which £55 are in quarries. Pop. in 1851, 7,465; in 1861, 7,221. Houses, 1,364. The church now in the town was originally a chapel of ease, and is dedicated to St. Thomas. The living of St. Helen is a vicarage, and that of St. Thomas is a p. curacy in the diocese of Manchester. Value of St. Helen, £400;* of St. Thomas, £150. * Patrons of St. Helen, R. and T. Pedder, Esqs. ; of St. Thomas, the Vicar of Garstang. The chapelries of Calder Vale and Pilling are separate benefices. There are dissenting chapels in some of the townships; and there are a Roman Catholic chapel and school, a national school, an endowed school with £6, and other charities with £180. Details about the census records, and indexes for Garstang. You can also perform a more selective search for churches in the Garstang area or see them printed on a map. The Register Office covering the Garstang area is Lancaster. Ask for a calculation of the distance from Garstang to another place. "GARSTANG, a parish and market town, in the hundred of Amounderness, county palatine Lancaster, 10 miles S. of Lancaster, and 230 from London. It is situated on the Preston and Lancaster canal, and the river Wyre forms its eastern boundary. The parish is very extensive, and includes the twelve townships of Barnacre-with-Bonds, Bilsborough, Calms, Catterall, Claughton, Clevely, Garstang, Hambleton, Holleth, Kirkland, Nateby, Nether Wyersdale, Pilling, Winmarleigh, &c. The town was incorporated in the first instance by Edward II., and afterwards received a charter, with extended privileges, from Charles II., its government being vested in a bailiff and 7 burgesses. It was occupied by the Pretender for a short time in 1715. One main street forms the principal portion of the town, which is clean, and has communication with the opposite, side of the river Wyre by means of a handsome bridge. There is a town hall, in which the public business of the place is transacted. Petty sessions are held here fortnightly, and it is a polling-place for the northern division of the county. It is also the head of a Poor-law Union, embracing 23 parishes, and of a superintendent registry and new County Court districts. The river affords abundant sport to the lovers of angling. The living is a vicarage in the diocese of Manchester, value £400. The parish church, which is situated in Church Town Kirkland, is dedicated to St. Helen. There is also in the town a chapel-of-ease, dedicated to St. Thomas, the living of which is a perpetual curacy, value £150, in the gift of the vicar. At Pilling there is a district church, a perpetual curacy, value £124. The parochial endowments, for various local purposes, produce nearly £190 per annum. The Independents, Wesleyans, and Roman Catholics have each a chapel, and there is a free school with a small endowment, as well as National school, and one belonging to the Roman Catholics. There are also chapels and schools in some of the townships In the neighbourhood are the ruins of Greenhaugh Castle. Thursday is market day for provisions and grain. Fairs are held on the 12th April, Holy Thursday, 10th and 11th July, and 22nd and 23rd November; and for live stock every alternate Thursday, from the first Thursday in Lent to Holy Thursday." 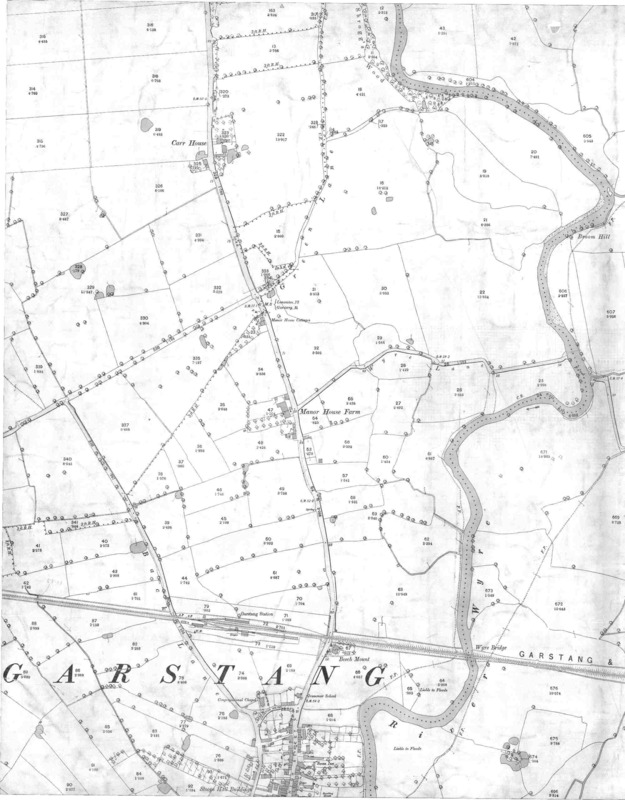 In 1835 the parish of Garstang contained the townships of Garstang, Pilling, Winmarleigh, Cabus, Nether Wyresdale, Nateby, Kirkland, Barnacre with Bonds, Catterall, Claughton and Bilsborrow. 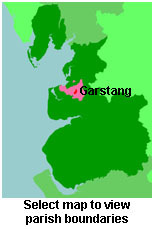 You can see the administrative areas in which Garstang has been placed at times in the past. Select one to see a link to a map of that particular area. View maps of Garstang and places within its boundaries. 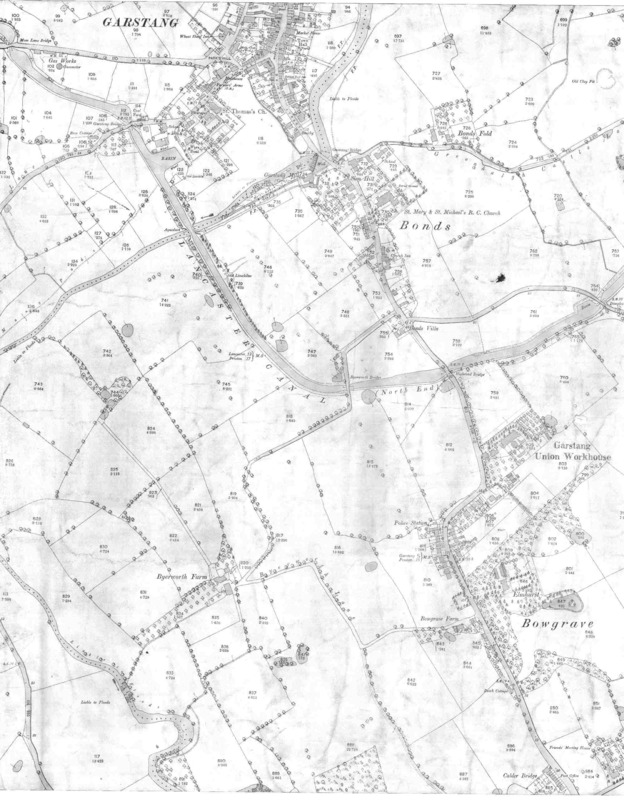 Maps of Garstang North and South around 1890. The Workhouse site has an interesting description of Garstang workhouse. For probate purposes prior to 1858, Garstang was in the Archdeaconry of Richmond, in the Diocese of Chester. The original Lancashire wills for the Archdeaconry of Richmond are held at the Lancashire Record Office.